By February 1915 more than 20,000 Australian soldiers had landed in Egypt as part of the preparations for the Gallipoli campaign. 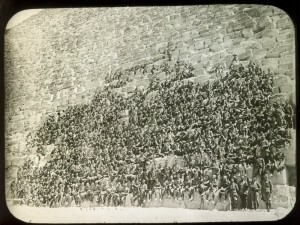 Many of these troops were based at the Mena camp at the foot of the pyramids. 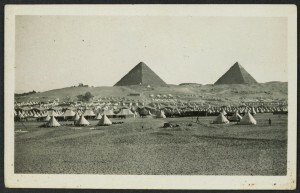 Letters and diary entries from Australian soldiers and nurses in Egypt abound with descriptions of the many monuments of Egypt, especially the pyramids and the Sphinx. Some of the Australians were so taken by the pyramids they decided to climb them for a better look. At a height of 137 metres and an angle of 52 degrees, this was no easy feat. Many of those who did this described what it was like to sit atop one of the pyramids. 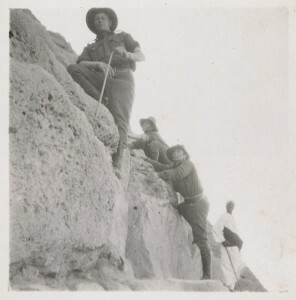 One soldier, C.W Frost, from Ballarat, described the climb as hard, ‘but not very dangerous’. While Lieutenant A. J. Williamson from Shepparton, was more wary of the danger, warning that ‘you have to be very careful, lest you get giddy and fall’. Some even conducted races up the pyramids and made a record of the best times, which stood at 4 minutes. But this practice may have diminished after a group of Ghurkas (soldiers from Nepal) were observed to have ascended the Great Pyramid of Giza at a time of only 2 minutes. Sadly climbing the pyramids was also dangerous. A number of soldiers fell and several died from their injuries. In March 1915, Private Reginald Beard had climbed only a few metres when the stones broke up and he tumbled to the ground. Unfortunately for Private Beard his fall went unnoticed and he lay helpless on the ground for several hours and was not rescued until the next morning. After surgery in Egypt, Beard was then evacuated to Australia and eventually died of his wounds in the St Kilda Military Base Hospital in July 1916. On the same day of Private Beard’s accident Norman Veness, a letter-carrier from NSW, fell a staggering 100 metres but miraculously did not suffer any permanent serious injury. 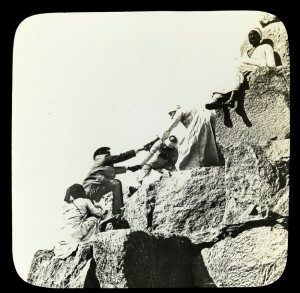 Eventually after several deaths and serious injuries the military authorities acted and restricted access to the pyramids and erected warning signs. It is a considerable irony that some soldiers perished at the site of the world’s largest tomb without ever seeing active service. While these deaths were tragic and should have been avoidable, far more soldiers suffered in Egypt from illness and infectious diseases. Army medical records for the 1st April 1915, reveal that 1,712 soldiers were sick in hospital, or unfit for duty due to illness. To this total can be added 341 cases of soldiers unfit for duty due to veneral disease. Serious as all this is, it was soon overshadowed by the battle casualties which began for Australian troops on 25 April 1915. Anzac and Empire: The Tragedy & Glory of Gallipoli by John Robertson, Hamlyn Australia, Port Melbourne, Vic., 1990. The Australian Army Medical Corps in Egypt By James Barrett and P. E. Deane, H. K. Lewis & Co., London, 1918. Written by Tim Hogan, Manager of Victorian and Australian Published Collections, State Library of Victoria.